CSIRO is exploring the ecological, social and economic consequences of energy-food-water-related investments in the Mekong region and how governance of these investments could be improved to support justice, equity, fairness and sustainability. 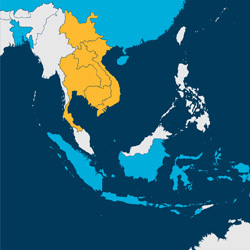 The Mekong Region encompasses Cambodia, Lao PDR, Myanmar, Thailand, Vietnam, and China’s Yunnan Province. Vast, diverse and dynamic, the region covers 2.3 million square kilometres and is home to more than 260 million people, with a myriad of ethnicities and cultures. Available evidence, including from recent climate projections, indicates that climate change will impact negatively on people in the Mekong Region. Impacts are likely to occur as a result of changes in rainfall and sea level, with people in coastal communities increasingly exposed to coastal erosion, salt-water intrusion and storm surges. Governments in the region have access to numerous adaptation and development plans from different agencies, sometimes overlapping and contradictory but lacking clear scientific evidence, particularly for specific locations. The major upstream use of water in the Mekong River is for hydro-energy and fisheries. Downstream in the Delta, the dominant use is for irrigated agriculture (mainly rice) and shrimp production in ponds. The interrelationship between these competing demands is commonly termed the ‘water-food-energy nexus’. Using local and regional future scenarios, the project helped stakeholders understand the interaction of energy, food and water ‘nexus’. The project informed their thinking of the possible consequences and unintended side-effects across sectors and across national boundaries. This understanding has informed and influenced their investment decisions about the sustainable production, distribution, and use of energy, food and water. Better policy and investment decisions will, in turn, improve people’s wellbeing and the sustainable development of the Mekong Region. The project operated at both the local and regional scales with local research organisations undertaking the local case studies, working closely with in-country government decision makers. At the regional scale, CSIRO and local researchers analysed the dynamics of energy, food and water. The regional studies explored a spectrum of likely, possible and desirable development pathways for the Mekong region. Key decisions on water-related property rights across Laos will need to be made over the next 25 years. It is critical to identify what options are available and to understand their social, economic, and environmental consequences. Decisions on diverting water from catchments such as the Nam Ngum River basin highlight trade-offs between national irrigation needs and hydropower development as well as the actual economics of transferring water. Our research partners are the International Water Management Institute (contact: Guillame Lacombe) and Lao Water Resources & Environment Administration (contact: Bounthanh Bounvilay). The northeast of Thailand is the country’s most impoverished region and for decades has been a top priority for national development schemes. This research is developing participatory scenario processes for Northeast Thailand, framed by the higher scales of the national and Mekong regional contexts and possibilities. Our research partners are the Khon Kaen University (contact: Yanyoung Imyoung) and the Stockholm Environment Institute (contact: Chayanis Krittasudthacheewa). The Tonle Sap Lake and its floodplains are crucially important for Cambodia in terms of livelihoods, income and food security. This local study assessed the cumulative impact of basin-wide development and climate change on Tonle Sap’s hydrology, and links to water-related livelihood. Our research partners are Aalto University (contact: Matti Kummu) and the Institute of Technology of Cambodia (Someth Paradis). The Mekong Delta is crucial to food security of Vietnam but is vulnerable to changes arising from energy, irrigation and flood-control infrastructure, land-use changes and climate change. An integrated assessment of the possible futures for the food-water-energy security nexus will assist local and regional planning as well as strategic responses to large-scale trends, security concerns and uncertainties at the national level in Vietnam. Our research partner is Can Tho University (contact: Nguyen Hieu Trung). Skills and knowledge were built in the research team, enabling local researchers to analyse and document climate projections and future development scenarios for the Mekong Delta provinces of Vietnam. A salt water intrusion map of the Delta was produced, drawing on latest scientific evidence of trends in sea level rise. The map identifies optimal land uses under different scenarios. It provides an evidence base for decisions about energy, water and agricultural development in the Delta. The evidence includes quantitative modelling showing that rice/shrimp production systems remain relevant into the future under different scenarios, but that in some circumstances, alternative agricultural commodities may be more optimal (e.g. salt tolerant crops and high-value horticulture). It indicates that small-scale irrigation infrastructure, together with cooperation between provinces on water use and management, would have greater impact on lifting rural communities out of poverty than large-scale irrigation. Participatory planning approaches were introduced. Building on existing capacity in Can Tho University, the Mekong Futures project engaged the research team in a series of six workshops, introducing the CHARL- Challenge and Reconstruct Learning approach. The CHARL approach challenges current thinking by introducing alternative development scenarios and scientific evidence (including climate change projections), engaging stakeholders in a participatory learning process designed to identify a range of development options, beyond the status quo. In a situation where there is very little cross-border coordination, bringing stakeholders and decision makers together through the CHARL process provided a forum for informed debate about the impact of upstream water use and river development on people who depend on the water downstream. Further training is needed to fully develop skills and capacities in the CHARL approach in the University but the team is extending the underlying participatory approach to other workshops (e.g. with the Dutch Embassy in a climate adaptation project in Soc Trang province). Scenario planning skills were built in the University team. The scenario planning included looking at the potential impact on livelihoods of different energy production options upstream and water use options downstream. The team is applying these skills in other work, including the Mekong Delta strategic planning, with Dutch Government funding. Opportunities to influence development policy emerged during the project. The approach challenged current beliefs, posing alternative development scenarios that could deliver greater benefit to poor rural communities by opening up development planning to a more diverse range of agricultural production options. The University is working with central and provincial governments, and international donors, to use the scientific evidence and participatory approaches developed through the project in planning for agricultural development in the Delta (Ministry of Agriculture, provincial Departments of Agriculture, the Dutch Masterplan for the Delta, the Mekong River Commission, World Bank and USAID). The aim is to shift thinking towards greater coordination and evidence-based policy, which can then inform technical solutions, considering future scenarios and wider impacts. These linkages to development planning agencies, and targeted communication of results are critical to success. If they are constrained, the ultimate impact of the results will also be limited. There must be a balance in focus between scientific output and the change process. Success will emerge if the science is allowed to inform change, and the change process is understood and can be replicated. In this case, the science promoted a shift in emphasis away from food security generally towards the livelihoods and incomes of vulnerable farming communities, resulting in identification of production and water governance systems that have greater benefits for the latter. In terms of Ministry of Agriculture status quo, this represents a significant shift, opening up a more diverse range of options. Development of skills in the team is essential if the approach is to be adopted and used more widely. Further training in modelling, in the CHARL, greater exposure to scientific reporting and interactions with other Mekong Futures teams would have improved and deepened the impact of the project. a series of future-oriented scenario narratives produced through the regional local studies. These were generated using participatory brainstorming and group discussions to produce a set of ‘visions’ – or verbal images and storylines of an ideal future – of the wider Mekong Region. Working collaboratively with stakeholders, we are developing exploratory local and regional cross-sectoral scenarios that support cross-scale and cross-sectoral dialogue and improve stakeholders’ understanding of the likely consequences of decisions. The scenarios represent visions shared across multiple relevant sectors allowing for consensus-building coordination. Additionally, scenarios embed visions from other places in the Mekong region and implicitly facilitate a coordination of trans-boundary development. Scenarios are implemented at local and regional levels. Scientific evidence for what consequences a selected list of (national and regional) development strategies are likely to have. This research integrates across hydrological, agricultural, social and economic domains and, where appropriate, is supported by modelling to test critical relationships. Large-scale household surveys provide a robust dataset to ground-truth decision makers’ assumptions on human adaptation responses and help fine-tune development strategies. Skills and knowledge were built in the local research teams, enabling local researchers to analyse and document climate projections and future development scenarios for the Mekong Region. Participatory planning approaches and scenario planning skills were introduced to the local research teams. The teams are now applying these skills in other work, including the Mekong Delta strategic planning, with Dutch Government funding.